Sylvia and Nicolas invite you to spend a pleasant holiday in the Allier (Auvergne) on their farm. Rural cottage for 8 persons and 1 baby (baby bed), labeled "3 épis Gite de France". 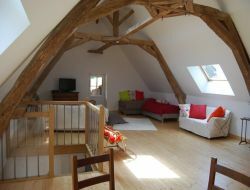 All comfort, 4 bedrooms, air conditioning, fireplace, green space, outdoor games, boules, bicycles. 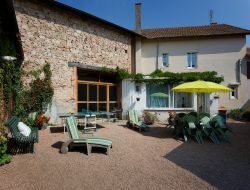 In the heart of a peaceful village, this holiday cottage will welcome you in a warm atmosphere, halfway between Paray le Monial (sessions) in Southern Burgundy, and Le Pal (amusement park) in the Allier in Auvergne. Equipment for baby. Village house of 60m² with a small terrace in front, sunny in the afternoon. A cottage for 2 to 3 people, including a room of 20m² with 2 beds (double and single), and a lounge kitchen of 35m². Our holiday cottage is a haven of peace and of tranquillity perched in 700 m of height in the Bourbonnaise mountain, between Chatel Montagne and Renaison. 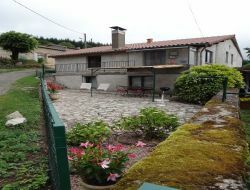 Possibility of welcoming 4 to 6 people, the gite provides you with a big garden with heated swimming pool, a logia with summer barbecue, gaming area, a winter barbecue and the sauna as well as the zone to play the petanque. Close to numerous cultural, sports and gastronomic activities. Come to get fresh ideas in family in our big holiday cottage of 7 people, situated in the borders of 3 departments (Allier, the Loire and Saône-et-Loire) and of 3 regions (Auvergne, Burgundy and Rhone-Alps). You will find quiet there, comfort and space completely enclosed in a pretty village. 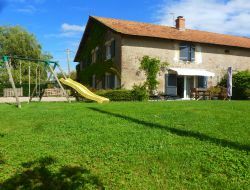 Gite in Auvergne (Allier) in the countryside, in a quiet and green place, for maximum 6 people, with swimming pool and outdoor games for children. Come to get fresh ideas in our holiday cottage situated at the heart of the Mountain Bourbonnaise. Holiday home which can welcome up to 3 persons, offers you a bright and warm environment opening on a porch overhanging a flowery stone terrace of 50 m². At the gates of Burgundy, between Besbre et Loire, in the heart of a farm with trees, this cottage has been completely renovated respecting the heritage but with comfort and modernity. Facilities: pool, bicycles, wifi. On site : hiking, fishing... Close to : Green Lane, amusement park, canal, river and canoes. 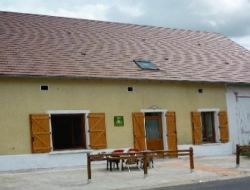 High capacity holiday cottage in the north of the Auvergne, in a nature reserve. Spacious house with swimming pool and comfortable seating 14 people. 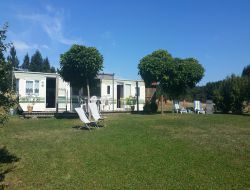 Gite (3 épis), ideal for nature activities (hiking, fishing...) or for family holidays (Le Pal amusement park).